The major advertising corporations like Facebook and Google are today some of the largest companies in the world. They essentially have created their own advertising marketplaces, wherein they are able to set the rules as to what advertising is and is not permissible. This is a good thing, for without advertising rules, these marketplaces would not operate properly and the rules are generally fair. The problem arises when these own companies enter the marketplace advertising their own products and break these rules. 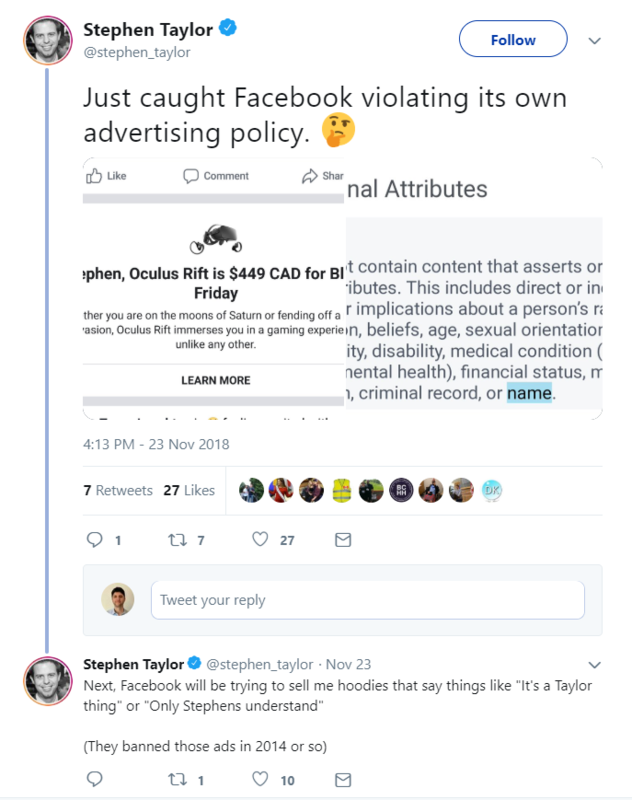 A client of mine was browsing Facebook during Black Friday 2018 and noticed a striking ad, that called out to him. The following is a screenshot of this ad, as it appeared on my client’s facebook newsfeed. You can see that the ad is extremely catchy as it calls to him by name and then promotes an offer. 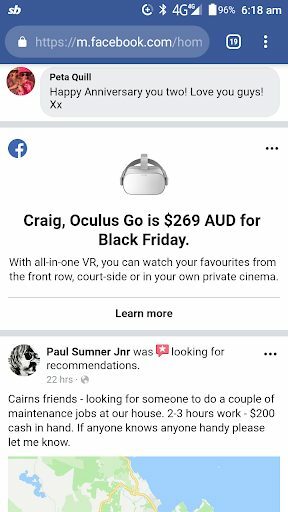 As you can see, this is an ad advertising the Oculus Rift product which is owned by Facebook. If you read through Facebook’s ad policies, they have a section called prohibited content. In this section, they clearly state that ads cannot contain any personal attributes including name. I have pasted below a screenshot of this policy. There is also another help article provided by Facebook stating this policy again which can be found here. Midway through writing this article I’ve noticed another person has also realised there is something not quite ‘kosher’ here. Stephen, in the below twitter comment, makes an interesting comment, that this personalisation could be taken further. How far will Facebook go with this until there is some kind of backlash? Clearly, there are multiple references on Facebook’s website that advertisers cannot use any personal attributes in an ad including name, yet here, a Facebook-owned company is advertising towards users using their own name. I have looked through the ads manager within facebook, and there is no possible way for me as an advertiser to customise ads dynamically to call on peoples names that are viewing the ad. So this has been provided only to Facebook. This means 2 things. Firstly, they are themselves using advertising tools and abilities that non-facebook advertisers do not have access to. And secondly, they are violating their own marketplace policies, which allows them to stand out even more with catchy personalised ads since no other advertisers have this ability. As an advertiser using its own marketplace, Facebook is not playing by the same rules that it subjects other advertisers to that use its marketplace. This is unfair. When I saw the Oculus ad on Facebook I immediately remembered back to 2013 when Google was caught out for something similar. Google was promoting the Chrome browser with a paid link campaign. The story was exposed by Aaron Wall from SEO Book. 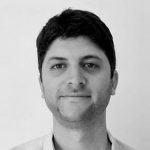 Even though this is an SEO issue rather than a paid advertising issue, it is still a case where there is a clear violation of major advertising platforms own guidelines. These are things that advertisers are often penalised for to the detriment of their own businesses. Aaron Wall explains that placing paid links in articles is a violation of Google’s search quality guidelines. Google was essentially ‘buying links’ without disclosing it. Danny Sullivan from Search Journal (SEJ) later wrote that Google actually penalised themselves, thus in effect this was an admission that they had violated their own guidelines. The above case was back in 2012. In 2013 there was another article from SEJ, which outlined other cases of Google’s own guideline violations. Google had penalised Interflora for running advertorials, yet shortly after it was revealed they themselves were doing the same things to promote Chromebooks, AdWords, Google+ & Google Analytics. The whole Interflora case was also shrouded in mystery, with Google not commenting or revealing many details. Granted that it is a difficult task Google has given themselves policing the entire web and ensuring that it has a fair set of policies and guidelines that everyone should abide by. However, not conforming to these themselves is hypocritical, especially when it the result leads to more profit by Google themselves. It’s beyond the scope of this article, but another related topic is advertising platforms enforcement of their own guidelines for their advertisers. It’s possible that guidelines and policies may not be enforced in cases and resulting advertising revenues are increased. This is moving away from how Google treats their own ads, but it is still an issue. One example I saw was Google’s content policies being violated by certain news outlets. Other issues include ads serving to underage app users. The list goes on.